As I said in the WC7 article, I've tried a few different sizes and styles of peltiers. So far, the TECs I've purchased from TE Distributing have been the best performers. I decided to stay with them for this purchase as well. I was looking for a single TEC that could meet or exceed the performance I had been getting with multiple TECs. One reason was the ease of building the cooler and the other was that with a single TEC, the peltier would end up being centered over the wafer of the processor. I reasoned that this would perform better than having the wafer align with the edge of one TEC as it does when using a pair of them. The TEC I chose from TE was the TB-127-2.0-1.65 / 48 (Click on "standard specs"). This peltier is rated at a max of 11.3 amps, 111.0 watts and 15.9 volts. The max Delta T is 70°C and the size is 48 X 48 mm (a perfect size at just under 2 inches square). I can get it to pull a maximum of just under 9 amps at 12.5 volts using my Rivergate Bulldog 30 amp power supply. As it runs for a bit the amperage decreases, but this is still one strong TEC. Unless you have one heck of a ATX power supply, a secondary power supply for the TEC is a must. Add a thin (.064" - ~2 mm) cold plate and you have more than enough power to cool any chip I have had the pleasure to overclock. The reason I have switched to a thin cold plate is that at the temperatures I was hoping to reach, I wanted to try and get the chip cold quickly - rather than to have to wait a minute or two until I could boot up. With the thin copper plate, the cold plate reaches sub-zero°F in under 30 seconds. This is nothing more than the WC4 water block adapted to run one 48 mm TEC rather than two 30 mm TECs. Tried and true and more than capable of getting rid of most of the heat from the TEC. I will be increasing the size of the water passages on WC8 to see what effect that has on the cooling, but at this point the performance is just short of outstanding. Yes, duct tape! This cooler has been coming apart so often that if I could have figured out how to incorporate a zipper, I would have. 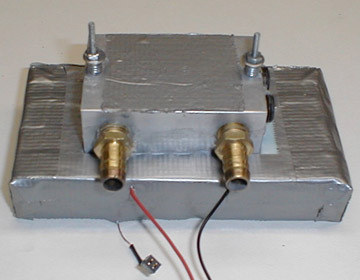 The small plug is for the cold plate thermistor and the tape on top of the block is used to secure the thermistor for the block temperature. Functional, not pretty. Installed and ready to go. The gray container was used for some "ice experiments." 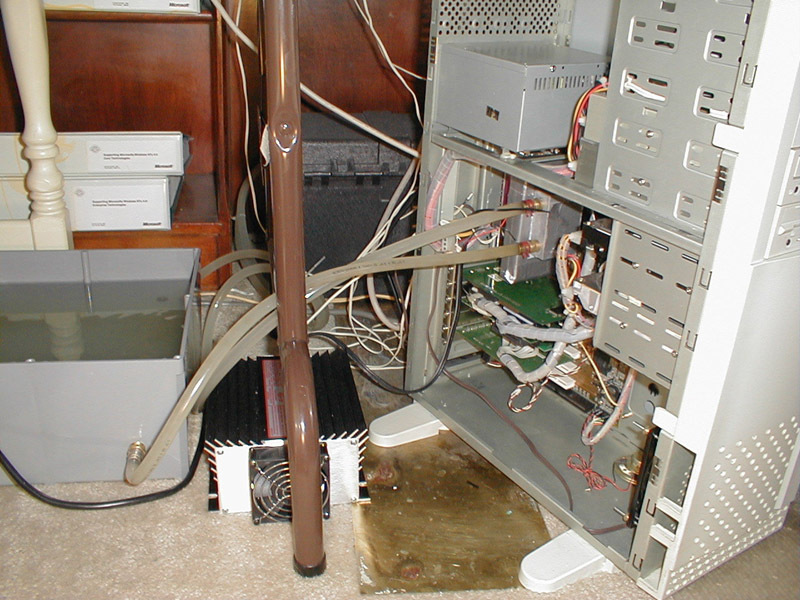 The black box in the background houses the radiator and fans. After a year or so, the clear tubing is no longer clear. The sheet of brass under the box was there for protection while I did some soldering. Click on the image for a better view. How Cold does it go? 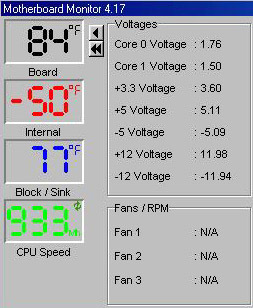 Negative 50 fahrenheit in a 78°F room with no ice or other help is what motherboard monitor reads for the processor's internal temperature with Rain running. Judging from the temperature of the thermistor on the outer edge of the cold plate, I will guess that this is pretty accurate. 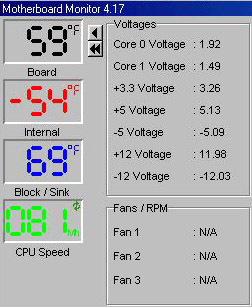 However, I do not know the tolerance range of the internal diode or the Winbond monitoring chip at these temperatures. I will probably end up adding another thermistor to the back side of the processor to see what readings I get there. Detecting floppy drive A media. INSERT SYSTEM DISK AND PRESS ENTER". I powered off the system and re-started it. 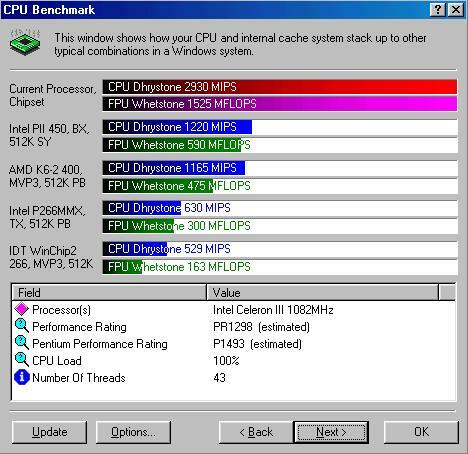 It booted right into Windows SE at 933 MHz at 1.75 volts. In fact, it will run up past 980 if I increase the voltage further. However, there was no need to go further with this chip. My original hope was to get a stable system with the PIII at 933 and I got it. While I have only run it a couple of days at 933, it has taken everything I could think of to test it with and never hiccuped once. Once I finish playing with the Celeron, this will be the processor for my main Windows box. I'd been waiting a while to see this. This was where the fun began. To start with, this processor would clock to 880 MHz with a stock PIII heat sink (with shim added). Water cooled and with the TE-48 peltier it would hit 960 on the Asus board before it would not restart after setting the speed in the BIOS. More voltage and getting it colder made no difference. On the BF6, I started at 960 at 1.75 volts. At the 1.85 setting (1.87 volts actually), it hit 1040 MHz and it seems to be quite content at this speed. Just to see how much further it would go, I pushed on. The limit for this chip on this board is 1080 at 1.95 volt setting. As 1.95 is actually 1.97, this is where I stopped. I did try to add ice to the water in hopes of getting a few more Hertz out of it, but to no avail. 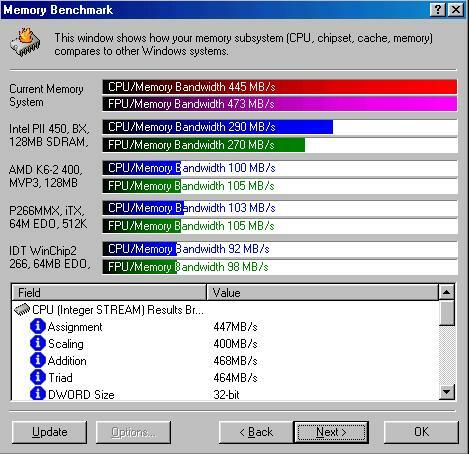 However, this was the first time I have ever run a processor at over double its intended speed, so I'm jazzed. The 1040 (045) is not "ice aided." The 1080 (081) is. One of these days, I'll have to locate where the "board" thermistor is located. It would appear that the ice had more of an effect on it than anywhere else. 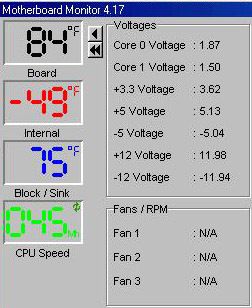 Even though the voltage states 1.92, it had to be pushed another .05 volts before I could benchmark at this speed. I also pushed up the 3.3 to 3.6. As you can see from the gradual rise in the base temperature for the internal diode in the 1040 test, I need to increase the size of the radiator a bit. The heat is gradually increasing. With a few ice cubes, the 1080 test doesn't increase much. At these speeds, this chip is on the "ragged edge" Without great cooling there would be no chance to make it though these tests. It might be fun to try to draw conclusions about which brand of motherboard is better by these results, but I don't think that the tests of one person on one example of each board amounts to much more than "In this situation, the Abit proved to be a better overclocker for me." I will go so far as to say that I think that the way the Abit version of the Award BIOS holds the bus speed if you have to power off during a boot is more conducive to having a chance at the higher bus speeds in a marginal situation. I think I have finally come upon a water block / peltier combination that works well for me. After seven attempts, one would hope that I would be getting close! There are a few more things I want to try to improve upon before I'm totally satisfied, but finally reaching a couple of goals is pretty nice. Time to get back to working on WC8.